The Great Ocean Road is one of the Australia’s great drives, but this weekend it will become one of the nation’s great rides. Wiggle Amy’s Gran Fondo – this Sunday 13 September – will hand over the iconic Great Ocean Road to a record field of more than 5,700 cyclists for one weekend only, in the fifth edition of this unique cycling experience, supporting safer cycling and the Amy Gillett Foundation. 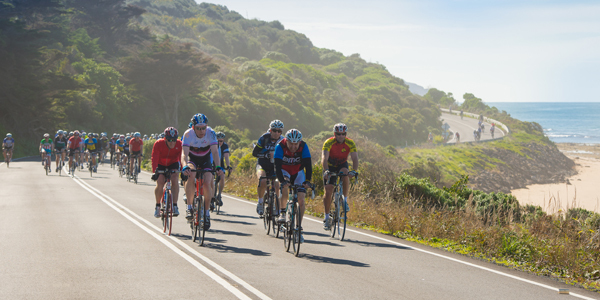 A once a year opportunity to ride a fully closed Great Ocean Road, this year’s event has continued to build on its 2014 sell out and, as a result, has increased capacity in 2015. It is a record number of registrations that would not be possible without the support of the State Government and its funding contribution through the Significant Sporting Events Program. Victorian Minister for Sport, the Hon. John Eren, said Wiggle Amy’s Gran Fondo plays an important role in teaching Victorians about bike safety. “The Victorian Government is proud to be supporting such a worthy cause. All Victorians should have a better understanding of bike safety, and Wiggle Amy’s Grand Fondo is playing a key role,” said Minister Eren. Wiggle Amy’s Gran Fondo is a proven economic stimulus to the Colac Otway and Surf Coast region, and also attracts a large number of participants from interstate and overseas. More than thirty percent of entries are from outside Victoria. Surf Coast Shire Council Mayor Margot Smith said Wiggle Amy’s Gran Fondo was a rare opportunity for cyclists to experience the magnificent Great Ocean Road in complete freedom and safety. “Last year’s Amy’s Gran Fondo delivered an estimated economic benefit of more than $6 million to the region,” said Cr Smith. Interim CEO of the Amy Gillett Foundation, Belinda Clark, said Wiggle Amy’s Gran Fondo is a fantastic showcase of safe cycling in Australia. “The Amy Gillett Foundation is Australia’s leading bike rider safety organisation, and we are thankful to have the support of State Government of Victoria and the Surf Coast Shire Council for the fifth edition of this great event,” said Clark. 110km Wiggle Amy’s Gran Fondo (Sunday 13 September) – picture thousands of cyclists amidst the breathtaking views of the Colac Otway and Surf Coast region, and it’s obvious why this will be one sight you won’t want to miss out on. 40km Australian Unity Medio Fondo (Sunday 13 September) – for those looking for something that little bit shorter, cyclists will set out on the Great Ocean Road from Lorne to Apollo Bay. 14km Australian Unity Family Fondo (Sunday 13 September) – a fun-focused ride that will ensure the kids and their families are well catered for. Amy’s Criterium presented by Europcar (Saturday 12 September) – the first of two stages of the Amy’s Otway Tour, as part of the Subaru National Road Series. New to the event weekend in 2015, the Criterium will light up the main streets of Lorne in a European style race that is guaranteed to entertain. Amy’s Otway Classic (Sunday 13 September) – returning for its second year, an event for the early-risers and Australia’s best female riders, and the eighth race on the Subaru National Road Series. Current individual rankings leader Ruth Corset will set out on the Great Ocean Road looking for further breathing room between herself and the rest of the peloton. Amy’s Wall powered by Subaru (Saturday 12 September) – this one turns things up a notch as competitors bust their gut on Lorne’s Bay Street hill for some incredible prizes; the perfect appetiser for Sunday’s main event. Born out of tragedy, the Amy Gillett Foundation was formed with a single purpose – to make bike riding safer. The Foundation is Australia’s leading bike safety organisation and aims to achieve zero bike fatalities in Australia. It recently launched the ‘We Remember’ initiative to commemorate the 10th anniversary of Amy Gillett’s death. Limited places for Australian Unity Family Fondo are still available here. All proceeds and fundraising associated with Wiggle Amy’s Gran Fondo will be directed towards cycling safety research, advocacy and educational campaigns and programs. Click here to access the event Media Kit.